I was quite comfortable wearing the Vango Breeze on a variety of short, low level walks with a light load. Although there's neither a chest-strap nor a hip belt to help 'take the strain', the wide-ish shoulder straps were quite comfortable. The air-mesh back system helped with ventilation although I did find that I got a little hot towards the end of any higher energy periods. There are also some other useful walking features. 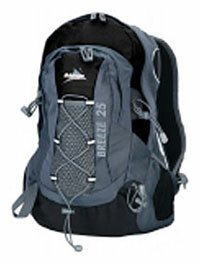 The Breeze is hydration pack compatible plus there is an attachment point for a walking pole. There's plenty of pocket choice too - a drinks pocket on either side, a mesh front pocket, a further good size front zipped 'organiser' pocket (where I stashed my OS map). The main internal compartment is accessed in full very easily via a zip opening. The Vango Breeze is a good value, hybrid daypack. A very useful, every-day leisure pack with enough walking features to enable you to use it as well for short, low level walks in the Spring/Summer when you need only the minimum of day-walk essentials.